Happy Spring..greet the day - March 20 | A.B.E. 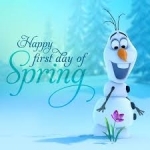 Remodeling, INC.
Hello Everyone... we just wanted to give a shout out and wish you all a pleasant and happy Spring...which officially starts on Sunday, March 20, however she is apparently bringing her friend Frosty SNOWman along with her this year. So don't put your shovels away just yet... The good thing we all know is that no matter how much SNOW Spring will bring... it won't stay very long. But still the same, it's no fun having colored eggs hidden under the snow...or those early Spring flowers covered up. Hey Frosty - we won't cry if you wave good bye and we'll see you another day >>in winter. Anyway, everyone have a splendid start to Spring. Enjoy. Until next post, be well & be Blessed.